Celebrate with Friends, Family or Colleagues this Christmas at the Harbour Hotel. 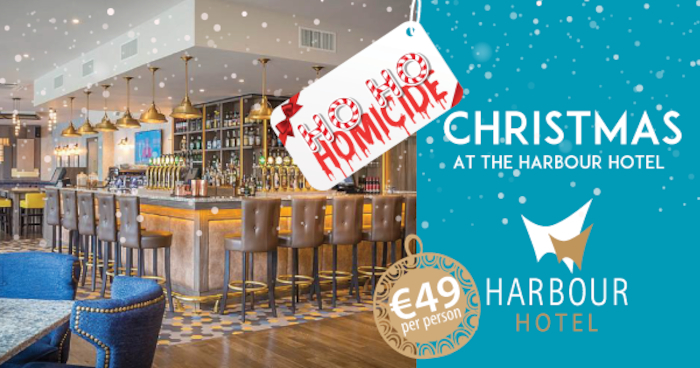 Perfectly located in the heart of Galway, the Harbour Hotel is a wonderfully atmospheric venue for a Christmas party or festive gathering. Surrounded by twinkling lights and mistletoe, with open fires, Christmas trees and the aroma of spiced Mulled Wine...Christmas has well and truly arrived at the Harbour Hotel and there is something for everyone. Choose from Christmas Party Nights in the John B. Keane Suite, the perfect venue for larger groups complete with cocktails on arrival and entertainment all night long. Or, for a Christmas Party with a twist, why not try our Mad Hatters Christmas Package or Ho-Ho-Homicide Party Package, if themed nights mean Christmas to you then these are the perfect party packages to get you in a merry mood. Dillisk on the Docks offers a more intimate setting, the fires are lit, and our Chef and his team have been working hard on a delicious Christmas dining menu filled with wonderfully authentic and locally sourced dishes and bar bites. On Christmas Day itself, Dillisk on the Docks offers you a menu inspired by seasonal ingredients bursting with local always flair, all served in relaxed and festive surroundings with Christmas trees galore and Santa Claus himself. The Harbour Hotel is selling fast for Christmas so book now to avoid disappointment. Our reservations team is ready and waiting to take your call, contact us on (091 )894800. We look forward to seeing you! Page generated in 0.0911 seconds.